The Coursera videos and Michael Nielsen’s book have helped me a lot to get the fundamentals right. Michael Nielsen’s book Neural networks and deep learning is a good addendum for the Coursera videos. It is a nice introductory book on deep learning which I strongly recommend. If you seek a more advanced book after finishing the course and book I mentioned above, Deep Learning (MIT Press ) by Ian Goodfellow and Yoshua Bengio and Aaron Courville might be a good choice. If you want to start implementing deep networks, you will need to learn tools like Google TensorFlow or Keras or Microsoft CNTK or Caffe or Theano. I would recommend TensorFlow (which is pretty new and is constantly improving with time); Also, Keras has TensorFlow as backend (the other backend of Keras is Theano), this can be a good choice for fast experiments of your deep learning ideas. If you want to do deep learning on clusters, you will probably need to learn Apache Spark or Hadoop. Getting a good handle on these tools is probably as important as learning about the math behind the models. Check out this GIF animation on Justin Francis’ twitter for a visual and intuitive training evolution of deep neural networks. 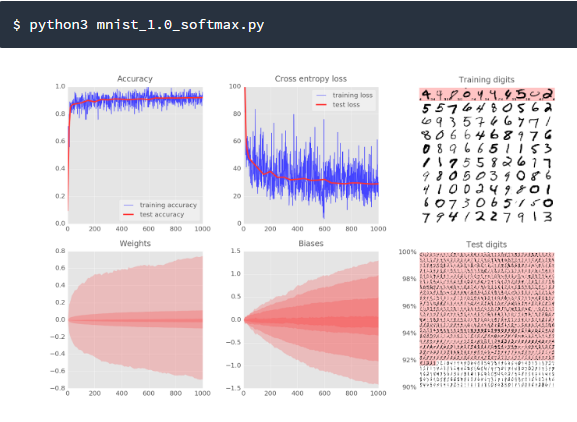 If you want to dig into more details about this, check out his tutorial: Not another MNIST tutorial with TensorFlow (pdf). I also recommend to check out this recent nice post 41 Essential Machine Learning Interview Questions (with answers) (pdf)(Jan 9, 2017) by Roger Huang. Apart from the popular TensorFlow and Keras, Microsoft’s CNTK is another good option for deep learning. Check out this post (August 3, 2017) by Andy Thomas for a tutorial (in Python) for Microsoft CNTK to build a neural network (pdf). 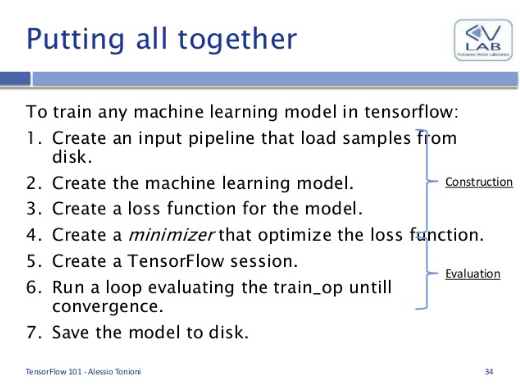 This is a pretty good introduction to TensorFlow usage. An 3-hour course (video + slides) offers developers a quick introduction to deep learning fundamentals, with TensorFlow. Check this code and this code out for an example of how to display a graphical visualization and you should also see training data in the terminal. Tensorflow – Intro (Mar2, 2017) – Slides and Github code (Inputs_types.ipynb). TensorFlow and Deep Learning without a PhD, Part 1 (Google Cloud Next ’17) by Martin Görner (Published on Mar 8, 2017) – Great explanation. (You can now run this yourself with a self-paced code lab). TensorFlow and Deep Learning without a PhD, Part 2 (Google Cloud Next ’17) by Martin Görner (Published on Mar 10, 2017) – very informative (Link to his GitHub code). Developers with no prior machine learning experience are welcome. We do recommend that you watch the video “”TensorFlow and deep learning without a PhD part 1″” unless you already know about dense and convolutional networks and are only interested in recurrent networks. This video is an intense technical video designed to help beginners in machine learning ramp up quickly. On-device machine learning: TensorFlow on Android (Google Cloud Next ’17) by Yufeng Guo (Published on Mar 10, 2017) – The explanation of CNN in this talk is pretty good. In this video, Yufeng Guo applies deep learning models to local prediction on mobile devices. Yufeng shows you how to use TensorFlow to implement a machine learning model that is tailored to a custom dataset. You will come away knowing enough to get started solving your own deep learning problems. Awesome deep learning – A curated list of awesome Deep Learning tutorials, projects and communities.